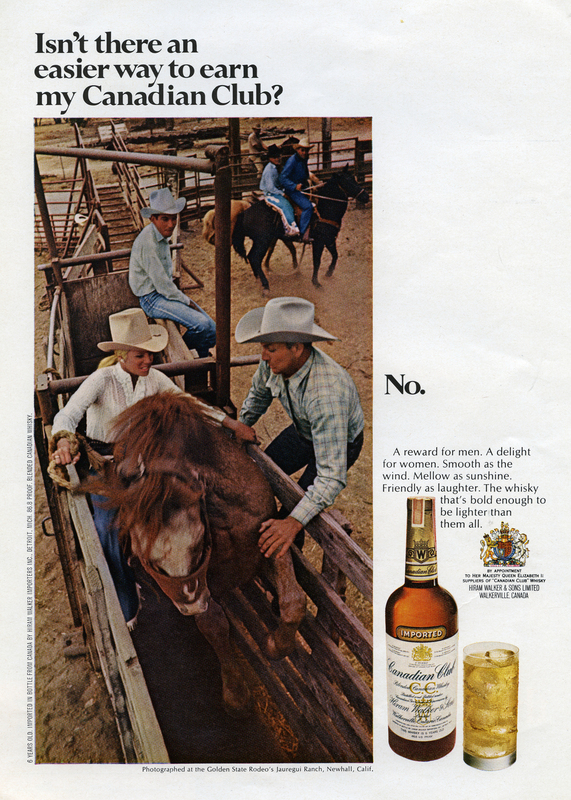 SCVHistory.com AL1969 | Jauregui Ranch | New Yorker Magazine, Canadian Club Advertisement, 1969. 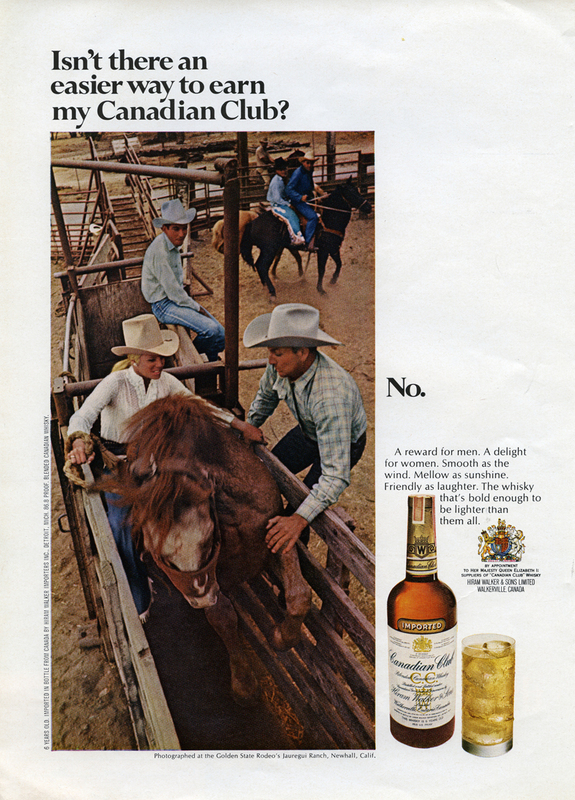 Canadian Club Whiskey Advertisement in New Yorker Magazine, February 22, 1969. Caption below photograph states: "Photographed at the Golden State Rodeo's Jauregui Ranch, Newhall, Calif."
Placerita Canyon was dotted with movie ranches from the 1920s to the 1940s, and Andy Jauregui owned one of them on land he leased from Standard Oil. Known as the Jones Ranch in the 1930s — when it was next door to property Trem Carr leased for his Monogram Ranch — the Jauregui property was sold by Chevron (aka Standard) in the 1990s to The Walt Disney Co. for an expansion of Disney's Golden Oak Ranch. Jauregui was a star of the Newhall-Saugus Rodeo (the current Saugus Speedway in Soledad Canyon) in the 1920s, '30s and '40s. He worked both as a competing cowboy, and later as Rodeo Manager and was on the Board of Directors of the Rodeo. He is a member of the Cowboy Hall of Fame, was friends with Hart and Tom Mix, and has a star on Newhall's Western Walk of Stars. AL1969: 9600 dpi jpeg from digital image of original magazine page.